Mountains tower over pristine Bowman Lake. The campground is located close to the shore and camp sites are within trees for shade and some privacy. Tent campers looking for peace and quiet will enjoy Bowman Lake for it's serenity and remote location. Be sure to pack bug repellent or headnets though, as mosquitoes often take residence at Bowman Lake. Potable water is available through water spigots in the campground, and there are pit toilets nearby. A picnic area provides day use visitors with the opportunity to enjoy a peaceful lunch, and there are day hiking opportunities near Bowman Lake for hikers eager to experience Glacier's wilderness. 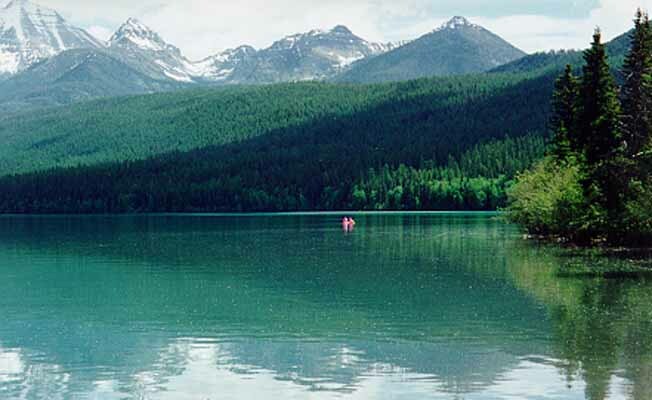 Fisherman, canoers, and kayakers will enjoy the recreational opportunities Bowman Lake offers. Motorized vessels are allowed on Bowman Lake, but are limited to 10 horsepower or less. Special regulations pertaining to food storage and generator use is in effect. Bowman Lake Campground is located at the foot of Bowman Lake in the northwest corner of the park, 6.3 miles northeast of Polebridge.